Last Monday I exercised my right to vote for the first time. I knew I wanted to make a blog post out of my voting experience I am just torn between publishing it over my personal blog, IzzaGlino or here at SavingsPinay. Well, since you've been reading it in the blog you know what my chose was, right?! The #Halalan2016 is the social-media election of the century. It trended in almost all platforms. People used their social-media in a lot of ways, some to ridicule other candidate while others led a fair game supporting their own candidate in every way they can. I did not post anything concerning the Philippine Election 2016 and haven't spoken whom my vote was for. But as someone who's a first-time voter I thought it would be nice to share my experience to everyone. 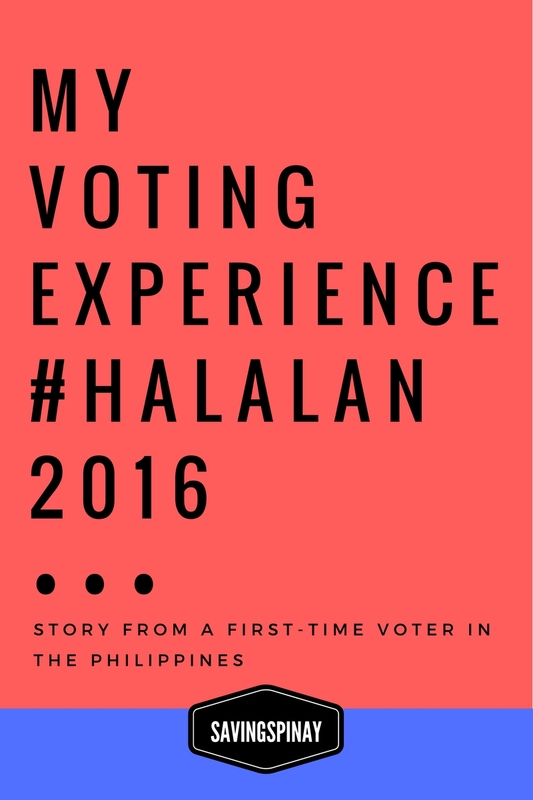 I have no idea where I'll start this story time so I thought I just start on How To Register Philippine Election 2016. The registration process was very easy to be honest. Me, my elder sister and sister-in-law were the only left non-registered in the family so we were really into registering for 2016 election. First you must be a Filipino citizen, at least 18 years of age on or before Election Day, a Philippine resident for at least 1 year and a resident of the place where you intend to vote for at least six months. To cut the process short we decided to get the application form online via www.comelec.gov.ph. Print three (3) copies of the Application Form and fill out. Tip #1. You can just print and fill out in the local Comelec office if you want to be guided on how the form is answered. Once your in the local Comele office you will go another step-by-step procedure from taking your photograph, digital signature and fingerprints. Don't forget to get your Acknowledgment receipt which will be detached at the bottom part of your application form by the Comelec personnel. As said in the beginning I kept my social media out of the whole "politics" during the campaign period. Back then I never even knew whom I will vote for. I became a silent watcher and listener just checking from time to time what's happening. The Social Media this year made a huge difference for every candidate and the Philippine Election as a whole. The black propaganda done by camps were massive. Funny memes were around my Timeline too. It was chaos. The Presidential Debate made a big impact for me. When I'm still not registered to vote I don't mind watching presidential debates. I don't pay attention on the candidate's platform and even their names. Now it's different. I enjoyed watching Presidential Debates and have actually made my decision through it. We all have our choices and last Monday I did chose mine. In the household we don't pressure each other on who to vote. You decide for your own. Very genuine. Again watching the Philippine Debate 2016 will make you fall in love with this man. He speaks from the heart. Proven Track Record. Davao has always been part of My Places to Visit list and seeing how Duterte led Davao is just pure amazement. Something New. Duterte showed something new...a never before seen side of a President. His flaws make him more makatao. His imperfections make him perfect for presidency. Political Will. His strong political will...his courage and how his toughness will make you confident to live in the Philippines. Proud and Pride. Duterte comes from Mindanao and he brings a unity towards Luzon, Visayas and Mindanao with it. I love how he can connect the three areas into one. I also am so proud to say "Presidente ko si Duterte"
I also voted for Cayetano as Vice President for I adore how he selflessly campaigned for Duterte. I hope he will be given a place in the cabinet by President Duterte. My senators were mostly new people but sadly most of them too did not win. It's saddening how the voting process here in our country can be. I thought we already learned our lesson from the past too bad... still shallow and incompetent candidates won as senators. I guess since this is the first time I will be voting I've felt really focused in the whole election process. I keep myself updated from the news. I actually thought this Philippine Election 2016 will be violent as I've witnessed how the campaign period can be too much of black propaganda. I felt so tensed waking up for the elections. It actually feels like I am taking an entrance exam once again. Fortunately me and my elder sister as well as sister-in-law were in the same precinct. I was surprised too that the election was peaceful. My experience was far from what I imagined it to be. Everything was surprisingly fast and easy. I double checked my receipt and we all went to Mang Inasal to have our lunch. I was full of excitement knowing who will win for the presidency. It was my main concern to be honest. When I heard that Duterte was leading I was full of happiness. I know there are stories that Mar Roxas will cheat but that massive lead prove otherwise. Filipinos just want and need a new leader. I felt a little disappointed that Cayetano and 10 out 12 of my Senators didn't made it. 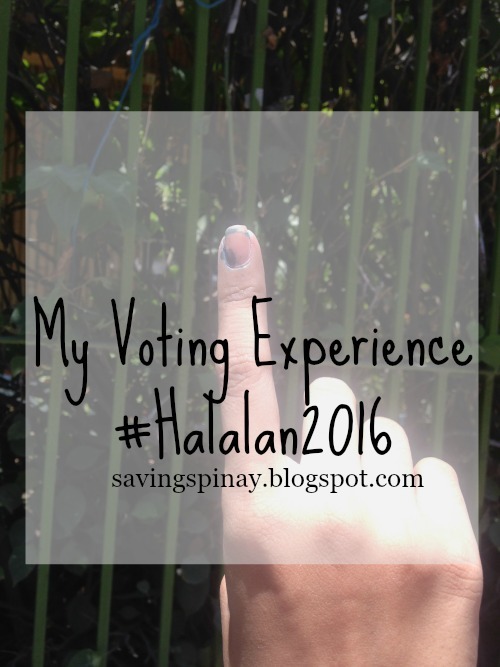 My voting experience during the #Halalan2016 was very ok. There's always a first time for everything and I will never forget this life event. I don't know what will happen in the future but I am excited on President Duterte's first State of the Nation Address. I am also excited on the leadership he will bring to the country. I pray for a better Philippines. I pray that the decision I made last Monday will be worth it. No regrets. How about you? How's your voting experience?